Tracy Russell has tried just about every fad diet and expensive “superfood” supplement out there. It wasn’t until she discovered the green smoothie that she lost 40 pounds, lowered her cholesterol by 50 points, and started running—marathons! 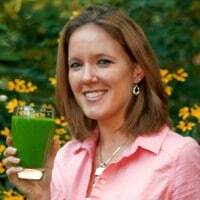 Tracy is one of the foremost experts on green smoothies and nutrition. She shares her wealth of first-hand information, research, and experiences with tens of thousands of people every day. Tracy is the author of one of the largest green smoothie websites on the Internet, Incredible Smoothies (incrediblesmoothies.com), which she launched in 2009 to help others achieve a healthy lifestyle. She is also a contributor to the Whole Pregnancy website (wholepregnancy.org). She has written guest articles for other blogs and magazines as well. Caryn: Hello everybody. I’m back. I’m Caryn Hartglass and you’re listening to ‘It’s All About Food’ on the 3rd of February 2015. Let’s lighten it up a little bit, shall we? Good! All right. I’m going to bring out my next guest Tracy Russell. She has tried just about every fad diet and expensive super food supplement out there. It wasn’t until she discovered the green smoothie that she lost 40 pounds, lowered her cholesterol by 50 points and started running marathons. She’s one of the foremost experts on green smoothies and nutrition and shares her wealth of firsthand information research experiences with tens of thousands of people everyday. She’s the author of one of the largest green smoothie websites on the internet incrediblesmoothies.com which she launched in 2009 to help others achieve a healthy lifestyle. Welcome to ‘It’s All About Food’ Tracy! Tracy: Hi! How are you? Caryn: Good. I’m really good. So we just had a very heavy first part of the program talking about the horrors of factory farming and all that it does to the planet and to people and to animals. And now I want to sit back and relax and just imagine delicious green smoothies (laughter). Tracy: It was a pleasure listening to some of it. Green smoothies are definitely—they changed my life. Like you said, you know, I’ve tried a lot of different things to be healthy out there and so it wasn’t until my sister in law introduced me to green smoothies that it changed my life. Food can definitely be a good thing or it can be a bad thing for you. It was amazing how just mixing things together and drinking it—it was delicious. I noticed the weight kind of started coming off. And then it wasn’t until about 4 months after drinking green smoothies I tested my cholesterol and I was surprised that it had gone down significantly. I have a family history of high cholesterol so I was very happy to see that. Caryn: We like happy stories here. We like happy stories very much. We need more of them and your sharing this information will help make more people happy and healthy so that’s a good thing. Tracy: My book “The Best Green Smoothies On The Planet” just came out in December actually and it has a lot of my favorite recipes in it. A lot of these recipes are smaller recipes than I usually make. For me personally I make a large green smoothie that’s about 32 ounces. So the recipes in the book, they’re for more of the beginner person getting used to drinking green smoothies and so I talk a lot about why green smoothies, the health benefits, a little bit of benefit about each fruit and what to add. Adding different things to your smoothie can definitely target different health goals that you have. So adding apples are going to help you lose weight, chia seeds because they’re more high in fiber. Adding things like oats, cashews, seeds—like hemp seeds, chia seeds, flax seeds—those are high in protein so they’re good for if you’re active and you’re working out. And you can get calcium from your green smoothies with dark leafy greens or with sesame seeds. You can also add almond milk. It’s a great source of calcium. So depending on what your health needs are you can get a really good boost of nutrients from your green smoothies and they are just full of energy. I was surprised. Like you mentioned, I actually ran a Chicago marathon. It was something that I never thought I would ever be able to do but it was one of those dreams in the back of my mind. I was like “I want to run a marathon some day”. So I was like “Nah I would never actually do it”. And then I just had this opportunity and I was surprised when I actually started running. I tried running back before green smoothies and I could not even run a mile. It was awful. I was so embarrassed. But after I joined a running group when I was probably drinking green smoothies for about a year and I was running, well I wasn’t running a marathon my first drink. I was running very fast for someone who was new and I did it. And I was really proud. I was actually kind of overwhelmed with emotion as I started running the very first—I ran probably about half a block and I kind of got emotional. I was like “Wow I cant believe I’m actually doing this”. Caryn: I can do this! Yes! Tracy: It was great. And you know people are always talking to me about how I have such glowing skin. And I actually gave up my coffee—my morning coffee—because I just had so much energy. A really funny story—I had someone on my website, not my website. Sorry, Facebook—Incrediblesmoothies.com the Facebook page, she actually commented. She said “this is a side effect from green smoothies?” She said “I made a smoothie and I had so much energy. I cleaned out my refrigerator. I couldn’t believe it. I was just full of energy.” I kind of laughed and I was like “Yeah, yeah that’s a wonderful side effect of green smoothies”. Tracy: I just gave up the coffee. So did my husband. We both, you know, we have a little child. Our son is about a year and a half. Even with the energy that he has we keep up with him. We give him green smoothies and we’ve been starting him green smoothies probably since he was 6 months old. Caryn: Now that can be dangerous (laughter) giving young kids green smoothies they’ll have even more energy than they normally have (laugher). Tracy: Oh yeah! I made that mistake. We usually give him a smoothie for breakfast and I made that mistake and gave him a smoothie for dinner. And his bedtime is usually around 8:00 pm and my husband and I at 9:00 pm we’re like “what’s going on?” And I’m like “Oh that’s right I gave him a smoothie for dinner.” But it’s a good thing. I feel a lot better giving him a green smoothie as opposed to a lot of processed food. A lot of people ask me about baby smoothies, or smoothies not fit for babies but for small children, but for my son I’ve been giving it to him since he was so little that I give him smoothies with dandelion greens and smoothies with kale. I don’t use a lot but a little bit. And so when you get your kids on smoothies very early you can actually mix what you would mix for yourself and just give them to them. Caryn: It seems like a natural for children because we feed children “baby food”. I’m not sure when baby food was discovered, but a puree of different fruits and vegetables and that’s really all a smoothie really is although smoothies tend to be more raw than cooked. Tracy: True. So something I would recommend if you’re going to start your child on smoothies I would wait until they’re about 6 months after they’ve had puree. And obviously you want to make sure they’ve had the ingredients in the smoothie. You know you can try one new ingredient but other than that I would make sure they’ve had everything in it. So I gave him his first smoothie was papaya, banana and kale and he loved it. He drank it. I was surprised when I first gave it to him. I was like “Let’s try it” and he loved it. I actually conned him into eating a piece of spinach because we only make smoothies. We put a little bit of this in it and a little that, eat a little this eat a little that. My husband and I we were making a smoothie with spinach and I just took a piece and I was like “Mmm this is yummy”. And so he took a piece and put it in his mouth and in a year and a half he was eating raw spinach. So it’s definitely something that helps kids get their nutrients in them and it’s definitely a good thing for everybody all around. Like I said it’s a great way to get target nutrients if you’re looking for certain things like calcium and iron. You can just find certain foods that have the nutrients that you’re looking for and then you can make smoothies with those ingredients. Caryn: You know there’s all different kinds of history all over the world of the food that people eat. And we’re just starting really to learn about nutrition with science. People will talk like they know a lot about nutrition and most people really don’t because we’re really just discovering things. But right now the current science promotes plant based diet, lots of whole minimally processed fresh fruits and vegetables, and for some people that’s really alien because their culture or through history they just haven’t been eating that way. Now with highly processed foods and junks foods and convenience foods people don’t know how to eat fruits and vegetables. And I agree a smoothie is a great way to reintroduce people to what they should be eating in a way that’s easy to go down. Tracy: Yeah, I’m definitely not a salad eater which is surprising because I’m in the nutrition field. Most people would be shocked that I don’t like salads. A lot of it is the fatty dressings you put on it or just other stuff. And it’s just not appealing to me to eat lettuce. But I eat in smoothies. I eat dandelion greens. I eat kale—it’s one of my favorite greens. You know, bok choy—a green I would never have thought to eat. And I eat beet greens, carrot greens, any kind of greens and put them in your smoothie. Caryn: Now I’m wondering and I don’t know if you know this. Do you know the history behind smoothies, when they were first discovered? Tracy: When they were first discovered? I don’t know. I know Victoria Boutenko sort of popularized it back in I think it was the 80’s, kind of brought it more to the modern world. But I know that some people have said—some people that are, I don’t want to say how old they are—but older, have said “Oh I was drinking smoothies but we didn’t have a name for it back in the 70’s”. Caryn: Well some people called them blended salads. Tracy: Yeah, they’ve been around for a very long time. They just haven’t been as mainstream. Caryn: Maybe with the invention of a blender. Tracy: Yeah. I think just recently they’ve become more and more popular. It’s a convenient thing. For me, I don’t like cooking and that was one of the big things that got me into green smoothies. I make a smoothie for breakfast. I make a smoothie for lunch. But you can make them in advance. They can sit in your refrigerator up to 48 hours. And so you can make them if you have a busy schedule. You can make one for everyone In your family. Put it in the refrigerator the night before. And then when everyone wakes up in the morning it’s just like “Okay here’s your smoothie”. You have to shake it a little bit. But yeah give everyone their smoothie. They drink them, put the glass on the side, and then you’re ready to go and you can have another one for lunch. Or, you can one for lunch and not for breakfast. But they’re just so easy and convenient. Caryn: You know, you mentioned in your book—I’ve got a big fear against plastic these days. And I use a lot of glass and stainless. When I’m traveling I store water or other drinks in glass bottles that has a rubber handle on the outside so if it falls it doesn’t break, those kinds of things. But one thing I haven’t thought about is a glass straws and I’m going to get a few of those. Tracy: Oh, I love my glass straws. I actually have a lot of glass straws by Glass Darma. They have these wonderful straws that have little beads on them. I hold them for my son but it helps him know how far to put the straw in his mouth because he’ll put it in but when it gets to the bead he won’t put the bead over his mouth. And so it’s great and it’s a great little tip. I mean, you have to hold it because it’s glass and he’s only a year and a half. He does really well with it and they’re decorative. They have some other straws. Glass straws are great and Glass Darma, they’re actually very durable. I know I’ve had mine for probably about 3 years now. I bought 6 of them. I did drop one once and it did break but that was my fault. I dropped it on a cement floor. But they replaced it so it was great. Yeah, we use the mason jars and you can get some lids for those that have holes on them, or holes on the tops. You just put the straw in it and it’s great. Caryn: And you’ve mentioned a lot of very helpful tips in the book and a few I want to highlight. So, to make a smoothie or a blended salad basically you need some liquid. You need some fruits. You need some greens, maybe some other items that you can add to it. A lot of times when if go to a store or a place that makes smoothies, they may not put the same good ingredients in that you’re going to get when you’re at home. A lot of times they use juice or other overly sweetened sugary processed stuff. Tracy: Yeah, that’s one of the issues people have. Caryn: Which gives smoothies a bad name. Tracy: Yes, it does. I know a few of the places I won’t really go get smoothies when I’m out. And then some places actually do. Most of the time you cant get a green smoothie unless you’re actually at a juice bar. Most of the time if you’re going to—I wont say the name of it but it’s a popular juice place—you’re going to get just your fruit and a lot of ice in it. They use fruit juices or sweet ingredients but I actually prefer to sweeten my smoothies with a banana. I find that it helps sweeten it enough. Caryn: And it makes it creamy and gives it a nice thickness. Tracy: Yeah, and you can use frozen bananas for more of like that ice cream/yogurt kind of consistency. I find as far as talking about actually making smoothies at home I know a lot of people have a hard time with greens and stuff like that. And there is actually kind of a little bit of a science to adding all ingredients to your blender to help them blend better. Adding your water first, then add your soft fruits like your banana, if you’re going to add any sort of berries—you add your soft fruit first. And then you add your harder fruits or your vegetables and then your greens. And if you’re going to add any ice you put that on top. Then when you blend it, it helps push everything down so the soft fruit and the liquid help create a vortex to pull everything down, kind of helps blend everything a little bit better so you don’t get as much chunks in your smoothie. Caryn: Now you said that you don’t like eating salads. Caryn: And that’s okay. But did eating these green foods and these smoothies and introducing more plant foods into your diet, did that expand your menu for other foods outside your smoothies? Obviously you had to be giving up something in order to lose the weight and drop the cholesterol. So what else changed? Tracy: I actually eat—my diet is very different from what it used to be. And that’s the thing about having green smoothies is you find they’re not as, well technically they are a processed food because they’re blended, but they don’t have that processed food flavor. So you really taste the banana. You taste the apple. It’s not apple flavoring. It’s an apple. Your taste buds change and start to shift. So I gave up a lot of processed food—cheese. I gave up dairy. I gave up meat. I gave up most packaged things. I used to eat a lot of those 100 calorie snacks. They’re only a hundred calories. I gave those things up and pretty much anything that says ‘diet’, ‘low fat’, or ‘eat me because I’m good for you’—anything that had to tell you it was good for you, pretty much gave it up. And kind of effortlessly the weight started falling off. For dinner, I stick to a lot of quinoa, brown rice. I definitely changed how I eat and I did eat a raw food diet for a while but then I sort of came back too. I liked cooked food so I started going back to cooked food. It was definitely an eye opener. I have a Vitamix and you can make so much in the Vitamix. You can make your own hummus. You can make your own nut butter. It makes this delicious raw ice cream with frozen bananas. You can use two frozen bananas as your base and then you use a cup of whatever frozen fruit you want. So you can use cherries and a little bit of almond milk just to make it creamy, a little splash of vanilla. And it’s delicious. So I make that all summer long and I even share it with my son. And it’s a great snack and I don’t feel guilty. Caryn: (Laughing) Oh gosh I’m thinking of that horrible ice cream commercial that I’ve seen on television where the parents don’t want to share their ice cream with their son, which is just a horrifying image to begin with. I’m glad to hear you share with your son. Tracy: Oh my son he eats everything I eat so it’s funny because literally if I have food he’s like ‘Oh what are we eating’. He gets pretty much the last bite of everything I eat. It’s a great diet. He loves our green smoothies. He gets so excited when the blender goes on. We’ll turn it on and he’ll just laugh and point to it and goes “vroom vroom”. Caryn: So you probably know that the best way to get children to eat better is to set an example by eating good yourself and to have the right foods available and not have the wrong foods in the house. Tracy: Yeah that’s correct. It’s definitely good having…he sees us drinking the green smoothies and even if he’s had something for breakfast—because when we get up in the morning getting him ready and getting ourselves ready getting ready for work—sometimes he will eat something before we get up. When we get up and make our smoothies he’s like “I want smoothies..give me some of mom’s…give me some of dad’s”. He loves them. Caryn: Now in your book you’ve got hundreds and hundreds of different recipes and you’ve used all kinds of fruits some of them are pretty average mainstream that anyone in the United States can find in most supermarkets. And then there are some that are more exotic, more tropical and for some people might be harder to find or not. The point is that the plant kingdom is huge. There’s a lot of variety and it never has to be boring. Tracy: Right. That’s one thing I tell a lot of people because they’ll look at my recipes and say “Oh I can’t find this” and “Can I use this?”. Or especially greens—greens are the big thing if you’re not in the United States—if I’m using something like bok choy or collard greens, people ask “where can I get that green?”. I tell people use the greens’ that’s readily available to you because that’s the most nutritious and you can use whatever. I’m not where you are so find the greens that are available to you. There’s just a huge variety, like you said, a variety of greens and fruits and even seeds that you can add to your smoothies. I try and keep them fairly simple so that the average person can go to the store and pick them up but sometimes that does get a little bit—I don’t want to say boring—but you get used to the same things. So sometimes I like to add goji berries or something that is a little more exotic for some people. Caryn: Yeah, well we get in routines and sometimes routines are good. Tracy: Yeah. I know my husband usually makes the same smoothie over and over again. He doesn’t really have much of a routine other than he rotates his greens a little bit. Caryn: Well as long as he gets his greens and he’s happy with it that works. Tracy: Yes, that’s most important. Caryn: Yeah. Well Tracy really nice talking to you and I’m feeling so much better now that we’ve talked about my favorite food—leafy green vegetables. I know there’s hope for the planet. Tracy: Yeah! Well it was nice talking to you. Caryn: Yes and take care! Tracy: Have a good one. Caryn: Okay bye bye! That was Tracy Russell and you can visit her website Incredible Smoothies www.incrediblesmoothies.com . Well we just have another minute and I wanted to mention, I think I mentioned it the last time, we started a new web series at www.responsibleeatingandliving.com . And if you haven’t seen it yet you can see the first one. We’re about to put up our second one. It’s called “Real good news in review”. We have a brief newscast. We go into the transition kitchen and make some great transition foods for people who are moving from the animal to the plant. Then we feature a local business whose doing some great things and either providing service or making a product that’s in line with our mission at Responsible Eating and Living. So I hope you check that out. Please share it, like it. Other than that, have a delicious week! Bye bye. I purchased one of your programs years ago. As a result the binder holding all the printouts were destroyed.